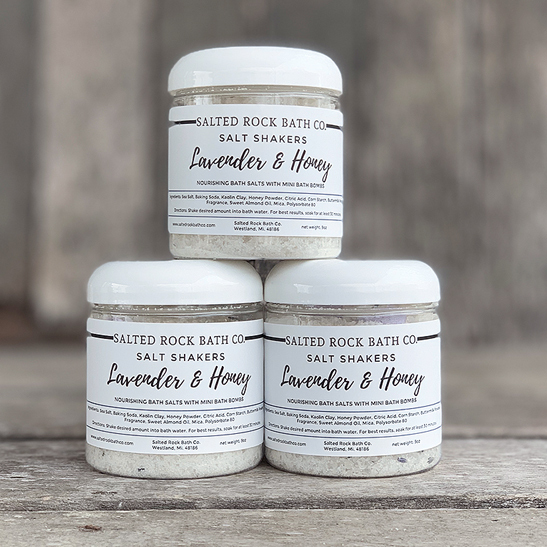 lavender and honey salt shakers – Salted Rock Bath Co. Lavender & Honey Salt Shaker is made with European spa salt and Dead Sea salt. The salts have been brushed with honey powder which is great for all skin types, but especially helpful for those with skin irritations such as eczema or dermatitis. The mini bath bombs contain sweet almond oil which moisturizes deeply and buttermilk which is thought to help rid impurities from the skin, lighten dark skin spots and is a gentle cleanser. It’s scented with a delicious blend of sweet lavender, orange and honey blended deliciously with coconut milk and Madagascar vanilla. Salt Shakers are a luxurious bath treat that let you enjoy the benefits of both a salt soak, and bath bomb. Traditional salt soaks help purify as they draw toxins and dirt from the skin. Sea salts are also thought to balance skin moisture, reduce muscle pain and improve the circulation of lymphatic fluid. Bath bombs are super fun, but also very therapeutic as they release skin nourishing oils and other ingredients into the bath water which help hydrate, heal and replenish skin. The Blend: Lavender & Honey is made with European spa salt and Dead Sea salt. The salts have been brushed with honey powder which is great for all skin types, but especially helpful for those with skin irritations such as eczema or dermatitis. The mini bath bombs contain sweet almond oil which moisturizes deeply and buttermilk which is thought to help rid impurities from the skin, lighten dark skin spots and is a gentle cleanser. The Scent: A delicious blend of sweet lavender, orange and honey blended deliciously with coconut milk and Madagascar vanilla. European Spa Salt is thought to be of the purest salts in the world because it is solar evaporated and harvested from the pristine waters of the Mediterranean Sea. Because they are a sea salt, they are thought to help draw toxins from the body and open pores. 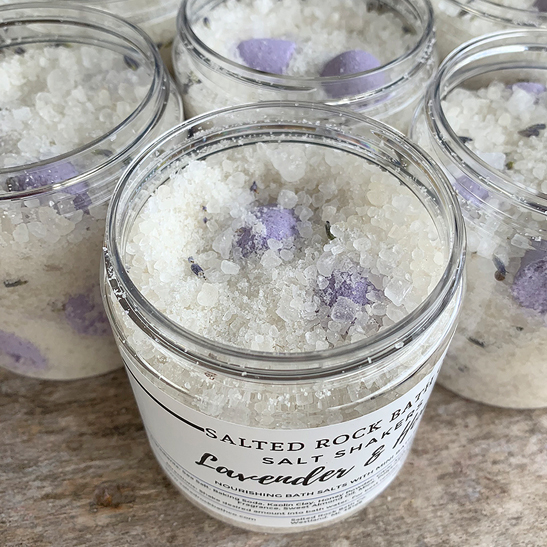 Dead Sea Salt: Soaking in salt from The Dead Sea is thought to benefit the body from the outside in.Many believe it treats skin conditions and improves internal processes. Dead Sea Salt contains 21 minerals including magnesium, calcium, sulfur, bromide, iodine, sodium, zinc and potassium.